Miguel's brother. While Miguel was the genius son, Gabe was the 'good' son and mother's favorite. While science is not his strong point, technology is. 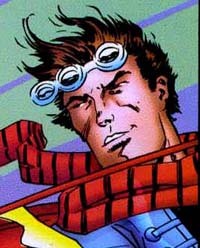 In Cyberspace, Gabe goes by the name of Firelight and was instrumental in thwarting the plans of Discord during the Domino Crash. He knows Miguel's secret from the beginning, but doesn't confront him about it till later. Miguel's fiancée, Dana, was Gabe's girlfriend until she and Miguel began an affair. Gabe's current girlfriend, Kasey, is infatuated with Spider-Man. Given so many reasons to envy his brother, Gabe was targeted by a shape-shifter who used their intimate knowledge of Miguel and Gabe to frame Gabe as being the Goblin. Gabe received apocalyptic visions and disappeared for a time. He was likely held captive at an unknown location by Doom 2099. Meanwhile, the shape-shifter masqueraded as Gabe under the guise of the Goblin. Following the defeat of the Phalanx, Miguel followed coordinates provided to him by Doom to seek out his brother. Once reunited, Miguel learned that Gabe was never the Goblin. As Vice-President of Alchemax's Research & Development division, Tyler Stone oversees various projects designed to increase the company's wealth. Among the projects under his watch are the Corporate Raider program, the Atlantis project, and Project Ares, and the Virtual Unreality program. Stone rose up the Alchemax corporate ladder by marrying former V.P. John Herod's daughter. He later had her killed, though Herod never learned of his involvement. Years earlier he fathered Miguel O' Hara after an affair with Conchata O'Hara, the wife of a Public Eye employee. Taking a keen interest in his illegitimate son, Tyler made sure that Miguel was admitted to the Alchemax School of Gifted Youngsters where his other son, Kron, also attended. After Miguel graduated, Tyler arranged for Miguel to be assigned to his division. When Tyler forced Miguel to test his Corporate Raider program on a human being before it was ready, the resulting death led to Miguel's decision to leave the company. Tyler slipped Miguel some Rapture (unknown to Miguel, it was only a simulation of the drug) in order to keep him in the company. This led to the accident which turned Miguel into Spider-Man. Tyler knew of Miguel's dual identity almost from the start but did not reveal it until much later. 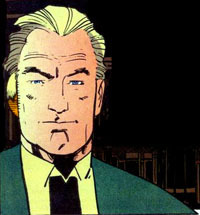 When Doom took over the US, Stone became his corporate liaison and stepped down from his post as VP at Alchemax. His time in the position was short-lived. He was nearly murdered by Conchata and by the time he recovered, Doom was ousted from power by his ex-Father-in-Law, Herod. 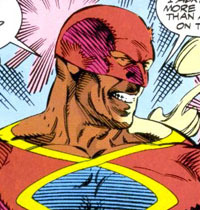 Tyler then spent his time attempting to reassert his power in Alchemax. His plans came to an end when he was killed during the Atlantean attack on the Alchemax building. The mother of the O'Hara family is insane, or so Miguel believes. Conchata suffered much abuse while married to George O'Hara. She however remains a strong willed woman dedicated to watching over both her sons. For years she has tried to love Miguel, but she has always found him to be a bitter reminder of the past. Years ago she and Tyler Stone had an affair, Miguel was the product of that affair. Over the years she became privy to many of his secrets. Foremost among them was the truth about how Tyler murdered his previous wife. Conchata used this knowledge to blackmail Stone. However when she observed that he continued to attack her family by manipulating Dana, she took the next step and attempted to murder him. She failed to kill Stone, but her attack did confine him to a wheelchair. When Tyler Stone handed over his job as head of Alchemax's R&D division to Miguel, Conchata took the job of being Miguel's executive assistant. It was in this capacity that she learned Miguel's secret and finally came to see him in a new light. 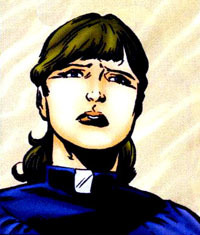 Conchata supposedly died when Atlanteans attacked the Alchemax building, however it was revealed she survived. Later she dedicated her time to pursing the shape-changer that framed Gabe. Spider-Man 2099 #26: Young Miguel story, becomes friends with Stone's previous wife, Nancy. Spider-Man 2099 #44: Learns Migue's identity. Cannibal. Psychopath. The Vulture is ostensibly a failed corporate experiment. Its unknown what corporation created him, he only refers to breaking away from "The Indys" possibly meaning he's actually from one of the independent cities outside Nueva York. The Vulture escaped his captors/creators and took residence in the lower levels of Nueva York known as Downtown. There he carved a niche for himself leader a group called the Freakers who run a protection racket. He first encountered Spider-Man 2099 when he fell into Downtown following a battle with the Public Eye. Vulture attempted to bring Spider-Man 2099 to his side as his "main man," but he refused the offer making the two enemies. The leader of the Freakers later teamed with the Goblin of 2099 to smear Spider-Man 2099's reputation and reveal him as a corporate tool. The Goblin planned to unite the different Downtown cliques and rise up against Alchemax. Vulture went along with the plan, but secretly intended to rule over all of Downtown himself. Plans changed when the city of Nueva York became flooded and invaded by an Atlantean army. 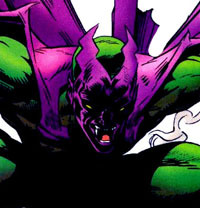 Vulture kidnapped Father Jennifer, left the Goblin to kill Spider-Man, and rigged explosives to destroy the Alchemax building. 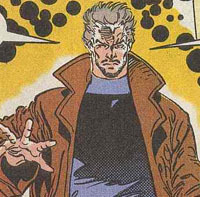 In the aftermath of the global flood Vulture resumes leadership of the mutant gang called the Wild Boyz as their "Big Boss." The Wild Boyz took to the seas to prey on the survivors of the worldwide flood. 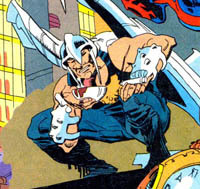 Eventually Vulture came into conflict with a former Wild Boyz member, Wulff. Having escaped from the gang previously, Vulture attempted to bring the young Wulff back into the fold, and succeeded. However Vulture's ship was attacked by the Phalanx, he disappeared shortly after. Spider-Man 2099 #38: Attacks Casey Nash in Downtown. Spider-Man 2099 #39: Sides with the Goblin. Spider-Man 2099 #40: Plots to betray the Goblin. Spider-Man 2099 #41: Disguised as a Thorite, he ferments hatred of the Spider-Man. Miguel's fiancée. Dana works as an assistant in the new market agro department at the Synthia East corporation. A caring spirit who, perhaps, cares too much. She entered Miguel's life by way of being Gabe's girlfriend. After she and Miguel 'clicked' one night, she dissolved her relationship with Gabe, while Xina rightly broke away from Miguel after discovering them together. She and Miguel became engaged shortly thereafter. Miguel never revealed to Dana his secret identity as Spider-Man, therefore putting a strain on their relationship. After Miguel's discovery that Tyler Stone was his real father, Miguel drove Dana away. 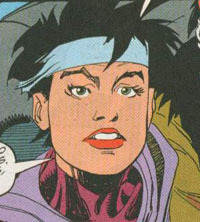 In Miguel's absence, Tyler began to make romantic advances on Dana, even taking her with him when he visited Washington following Doom's takeover of the country. 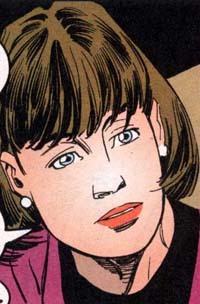 Dana met her end when she was taken hostage by Kron Stone / Venom. SHIELD troops shot and fired at Venom not realizing that thanks to the symbiote's powers, their bullets went through him and killed Dana instead. The other-dimensional being known as Thanatos had been marooned on this earth since the end of its Heroic Age. His discorporeal self was revived by the inter-dimensional experiments of Jordan Boone. A reawakened Thanatos took possession of a human body in the year 2099 and kidnaps Tyler Stone in order to gain access to the Virtual Unreality gate. He tries and fails to trap Spider-Man in inter-space. In Virtual Unreality, Thanatos finds Dr. Doom's Time Platform and arranges to bring Starfox and Captain Marvel to the year 2099. 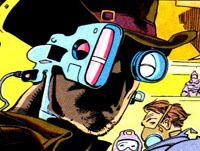 He then transports them to the alternate-future home of the Maestro. There while Spider-Man and Captain Marvel battle the evil Hulk, he forces Star Fox to steal some artifacts which will allow him to alter reality so that all versions of Rick Jones across the multi-verse will be based on upon. The elder Rick Jones of that dystopian future uses the power of Thor's hammer to end Thanatos' plans and return everyone to their proper space and time. Thanatos is killed by the elder Rick Jones and turned into a pile of bricks. Miguel's childhood friend and sweetheart. Xina and Miguel first met at the Alchemax School for Gifted Youngsters which they attended together. At the school, they were terrorized by Kron, son of Tyler Stone. Xina's studies were specialized in artificial intelligence programming. She also harbored a huge interest in the 20th century which fueled a secret interest in extra-terrestrial life, the existence of which was primarily taboo in 2099. As adults, Xina and Miguel became a couple. She moved into Babylon towers with Miguel where she programmed the apartment's holographic interface, Lyla. Miguel selected Marilyn Monroe as Lyla's holographic appearance as a reminder of Xina (she has a Marilyn tattoo). Xina eventually broke up with Miguel after discovering that he cheated on her with Dana, Gabriel's then-girlfriend. Years later Miguel renewed his friendship with Xina when he needed her expertise in repairing the malfunctioning Lyla. After Miguel discovered Tyler Stone was his real father, he joined Xina on a trip to visit their old school master, Angela Daskalakis. 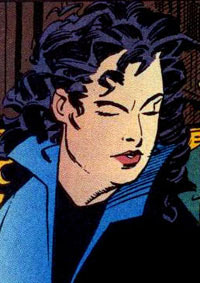 Angela had moved to an independent city, Nightshade. Following Doom's take over of America, Miguel assumed Tyler Stone's position as VP of Alchemax's R&D division. He offered Xina a job at the company. 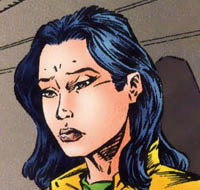 However following the death of Dana at the hands of Venom/Kron Stone, Xina felt responsible and left Nueva York. Her journey saw her picking up Net Prophet (John Tensen) and the two travelled together for a time. Following the Phalanx invasion, Xina joined the "All Father" (really Doom 2099) in his research to create a cure to the techno-organic virus overwhelming the planet. After the invasion was defeated, she returned to Miguel's side and together they worked to rebuild the planet in the aftermath. Spider-Man 2099 #19: First appearance. 2099: Manifest Destiny: Final appearance. A member of a genetically engineered species, specifically bred by Alchemax to function as underwater slave workers. The mutate known as Roman began as one many who worked on Alchemax's New Atlantis, an underwater city built on the ruins of ancient Atlantis. 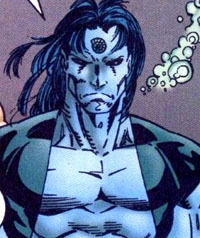 Amongst the ruins he found a chronicle written by Namor. Roman adopted a name which imitated that of the original Sub-Mariner and also began to model himself after the former ruler of Atlantis. He led a revolt in which the mutates took New Atlantis for themselves. The humans who fought against them were killed or experimented on in order to become more like the mutates. 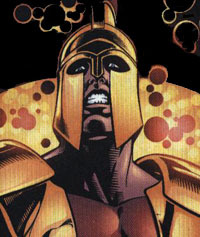 After learning from a spy that Alchemax would try and retake New Atlantis, Roman once again mirrored his predecessor by launching an attack on Nueva York, flooding the city, and summoning Gigantor. The attack was foiled by Spider-Man and Roman was taken prisoner by Alchemax. 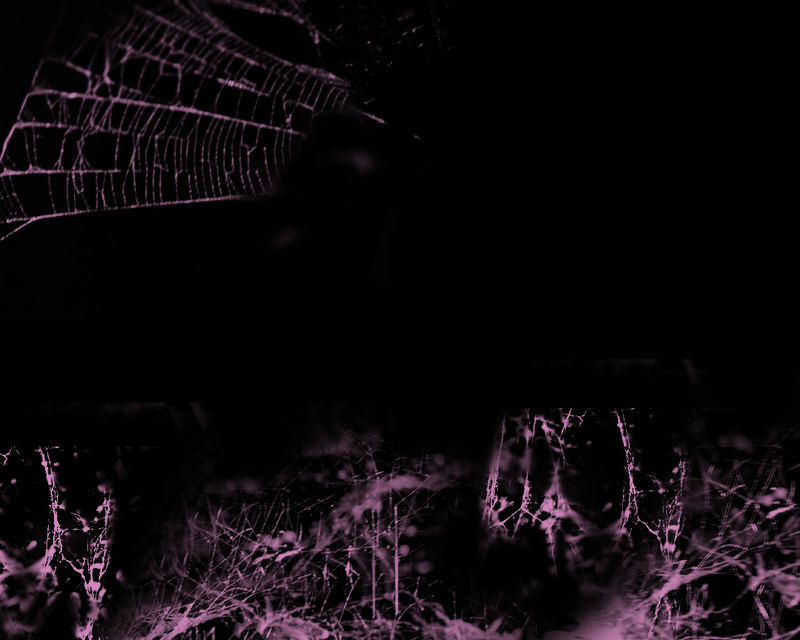 Roman escaped imprisonment and in the process came into contact/bonded with the Venom symbiote. Roman disappeared into the seas swearing to return. 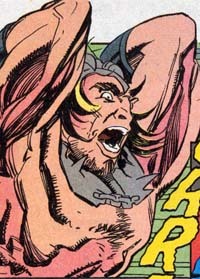 Following the reappearance of the "original" Atlanteans led by Attuma, Roman was said to have been killed, but no body was shown.